This Bemis Round Closed Front Toilet Seat is part of the Natural Reflections collection. The wood veneer seat features a natural wood look. The non-tarnish metal hinges provide a unique accent for your bathroom. This Bemis Round Closed Front Toilet Seat features a stylish moulded wood design for an attractive look in your bathroom. This lift-off toilet seat conveniently removes for cleaning and replacement. Simply twist the hinges and remove. Bemis Manufacturing Company prides itself on continuing to bring innovation, value and environmentally friendly products to you. Round High Density Enameled Wood Toilet Seat in Biscuit This High Density Enameled Wood seat provides superior strength and stability while matching the look of ceramic. The stylish metal hinges are long-lasting and are available in a variety of finishes. This slow closing seat is also easy to clean and remove. 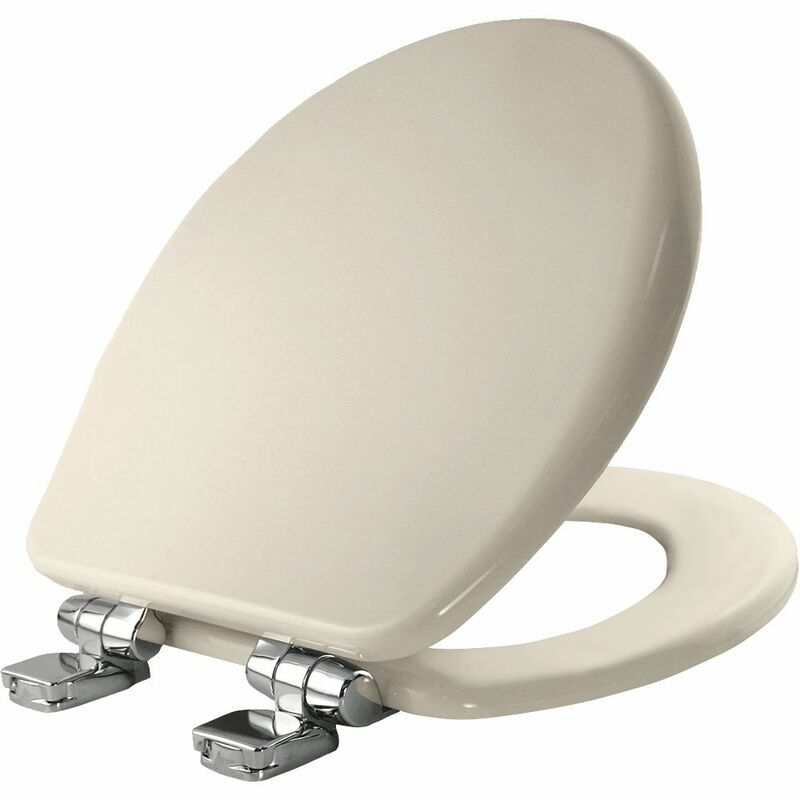 With the STA-TITE Seat Fastening System, the seat does not shift around and stays firmly attached to the toilet. Round High Density Enameled Wood Toilet Seat in Biscuit is rated 4.6 out of 5 by 7. Rated 4 out of 5 by HomeDepotCustomer from My daughter installed it. Easily. Although it didn’t match my... My daughter installed it. Easily. Although it didn’t match my almond commode. I looked for an almond color in this model and it wasn’t available. Rated 5 out of 5 by Donna from Love the metal hinges. They stay tight and do not... Love the metal hinges. They stay tight and do not loosen up like the other kind do. Would be nice if you handled more of this kind in the store. Rated 4 out of 5 by Michael from Good fit, right color, hinges could be a little tighter... Good fit, right color, hinges could be a little tighter fit in my opinion. Rated 5 out of 5 by PD from II’ve been ordering this toilet seat for quite some time... II’ve been ordering this toilet seat for quite some time now, and as far as I’m concerned; I am happily satisfied. Great Product!! !